Can anybody find meeeeeee somebody to love?" Maybe some people are not meant for anyone? Okay, onto cheerier subjects, of which there are several. I was surprised to look out my window this morning and see how much things have changed. Amazing what happens in ten days. The ducks are flying. The corn is so tall! The apricots are ripe (more on that later). The chicks have grown so much. 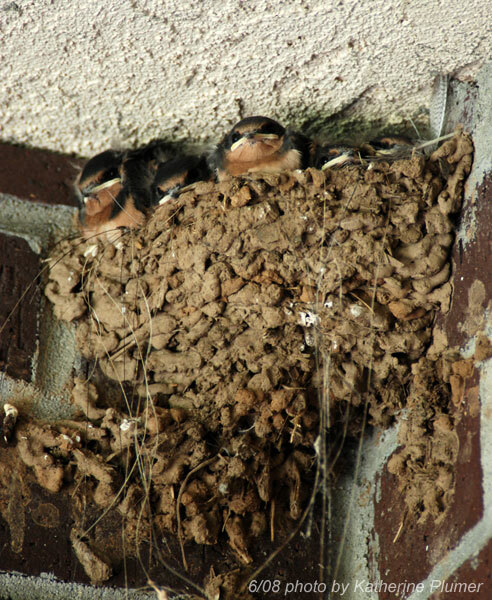 And the baby barn swallows were just pinkies when I left! Look at them now, I had no idea there were five! This evening I decided to pick "a few" apricots. Well, I realized when I went out there that they are pretty much all ripe right now, which means they all need to come off the tree within the next couple days, so "a few" became two buckets full, which barely made a dent. I pitted them and ran the whole lot through the grinder and oh my goodness I have enough puree in the fridge for six batches of jam. Um, that's insane. I mean, I'll do it if people are interested, but that's probably somewhere between 50 and 60 half pint jars. So, jam anyone? $5 per half pint jar, shipping $12 for up to 6 jars. My schedule feels all out of whack. This ought to be early for me but I think I'd pretty well adjusted to mountain time and gotten into the habit of going to bed much earlier than I normally do! That is actually a habit I should strive to maintain, hmm. Sure thing! Let me know, I certainly won't be making more than two batches of jam today anyway.